Clappersgate Bridge, The Lake District, UK. Fuji XT2, 10-24 lens. ISO100, 0.6″ at f/9.0. Polarizing filter. This week I want to share a simple image. There is nothing fancy here in terms of post processing. There’s no trying to be clever. It’s just a nice Autumnal shot that I made last weekend in the Lake District. It was shot using the Fuji XT2 at a place called Clappersgate Bridge, just outside Ambleside. The lens was the Fuji 10-24 which has really impressed me with its quality. I processed the image using Lightroom and I think it looks great at full resolution. The colours look superb. The conversion was done using the Velvia film simulation in Lightroom. I did need to tone the saturation down a little as well as open the shadows, but overall this is exactly the colour rendition I wanted to achieve. Deep, rich, vibrant colours without needing to pump up the saturation. In short, it looks natural which is exactly what you want to achieve as a landscape photographer. The depth of field was front to back despite my low position. The image was only shot at f/9 and I focussed on the grassy bank just to the right of the bridge. 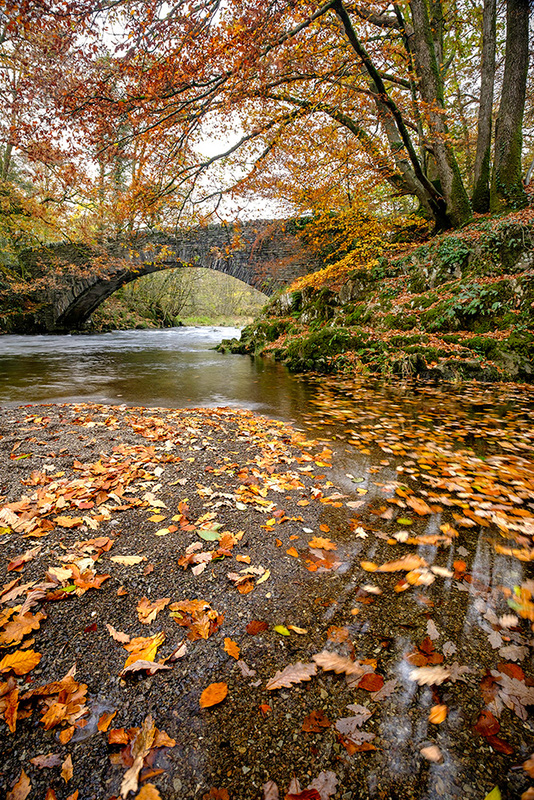 When you zoom in you can see the leaves in the foreground are pin sharp as are the distant trees which can be seen under the bridge. I didn’t use a filter on the sky. It would have been pointless because there wasn’t any definition in the sky. Despite this I could recover all the blown highlights as well as open the shadows to achieve a full tonal range. All this was from just a single RAW file shot with the XT2 and the resulting image is very clean. Great photo. I like X-2 a lot. Thank you. Its a great camera. Lovely image, I have a Fuji XT 10 it’s a great little camera. They are arnt they. The Fuji seems very good with colour handling. Yes. They are. I’m more a Nikon guy – and to get the colours right you always have to correct them a little afterwards. I tried Nikon for a while. It was a D800 but I couldn’t get on with it. I sold it in the end and wen back to the EM5. Despite this I was always a little jelous of the excellent results Nikon users seemd to achieve. Nicely composed image Andy. I agree with you on the 10-24 lens, it really is a performer. I sold mine a few months back in favor of the 14mm (which is great also)to better match my X-Pro2, but I think I may pick one up again for the times when I want the wider view and versatility. If you do get chance to pick up another example I would be tempted. A well composed autumn seen, I think that the autumn colours this year have been better than ever, a joy to see. Thanks John, pleased you like the image. Iactually think the colours haven’t been that good recently but then they seemed to peak all at once with more intensity than I expected. such a lovely Fall photo, Robin… thanks, for sharing. Thank you . I’m pleased you like the shot.